A person reaches out for a handshake; the other person takes their hand with two hands and tugs then dies as a consequence. That’s a rough description of newly discovered cellular mechanisms that eliminate T cells that may cause autoimmune disorders. Although the mechanisms are intertwined with biochemical processes, they also work mechanically, grasping, tugging and clamping, say researchers at the Georgia Institute of Technology, who, for a new study in the journal Nature Immunology, measured responses to physical force acting upon these elimination mechanisms. The mechanisms’ purpose is to make dangerously aggressive developing immune cells called thymocytes destroy themselves to keep them from attacking the body, while sparing healthy thymocytes as they mature into T cells. Understanding these selection mechanisms, which ensure T cells aggressively pursue hordes of infectors and cancers but not damage healthy human tissue, could someday lead to new immune-regulating therapies. Usually, researchers pursue such mechanisms using chemistry experiments, but Georgia Tech’s Cheng Zhu, who led the study, makes atypical discoveries via physical experiments to observe effects of forces between key proteins in living cells. In this study, they discovered a loop of physical signals resembling a double-handed handshake that encourages cell apoptosis. It is described in more detail below. The medical significance of this field of research was highlighted by the 2018 Nobel Prize in medicine, which was awarded to other researchers at other institutions, James Allison of MD Anderson Cancer Center and Tasuku Honjo of Kyoto University. Allison and Honjo received the prize for their cancer therapies exploiting T cell regulating mechanisms intertwined with those that the Georgia Tech researchers study. Georgia Tech's Zhu and first authors Jinsung Hong and Chenghao Ge published their new research paper on November 12, 2018. The research was funded by the National Cancer Institute, the National Institute of Allergy and Infectious Diseases, and the National Institute of Neurological Disorders and Stroke. The agencies are part of the National Institutes of Health. Like blood cells, human thymocytes are born in bone marrow, but they travel to the thymus, a small organ just below the neck, where they run a gauntlet of selection tests. Failing any one selection means cell self-destruction; passing all selections promotes thymocytes to T cells that depart the thymus to battle our bodies’ foes. One selection checks T cell receptors (TCR), which are on the thymocyte’s membrane, to ensure they are properly formed then to see if they recognize self-antigens, i.e. molecules that identify the body’s own cells. Then another selection, called negative selection, tests TCRs to make sure they don’t react too aggressively to self-antigens. Cells that pass these checks then have TCRs that tolerate self- yet react to enemy antigens. 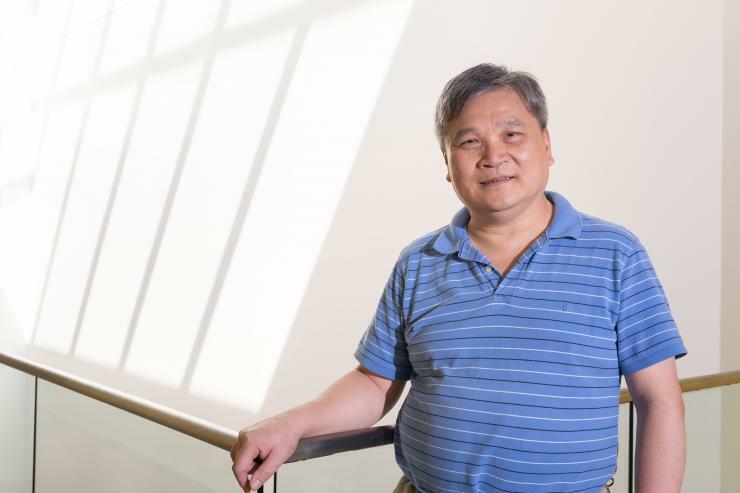 “You don’t want the cells with strongly grabbing receptor sites to turn against the body itself,” said Zhu, whose study focused on negative selection. In negative selection, other cells extend self-antigens on their membrane to interact with the thymocytes’ T cell receptors. Those interactions seal the thymocytes’ fate: advance or die. Studying forces in those interactions revealed a new signaling loop with mechanical properties analogous to a two-handed grip and tug by the thymocyte. The first hand would be the T cell receptor itself, and the other cell presenting the self-antigen would be like someone else’s hand holding a special ball out to the T cell’s first hand. The handshake begins as the self-antigen gives a signal to the T cell receptor. If the TCR reacts too strongly to the self-antigen, the thymocyte adds the second, assisting hand, which comes in from the side to make a two-handed handshake. The additional hand is a lever called CD8 (cluster of differentiation 8), which connects to key mechanisms inside the thymocyte and is considered part of the TCR site. For about two weeks in the thymus, multiple T cell receptor sites engage in one- or two-handed handshakes, which send signals into the thymocyte that make it either mature into a T cell or begin the process of programmed cell death. The researchers found that the two-handedness markedly resisted the force applied to break the grip between the T cell receptor and the self-antigen, thus prolonging the duration of the handshake. A long grip sent signals for the thymocyte to die. The researchers also made the novel discovery that CD8’s handshake participation constitutes a signal coming from inside the thymocyte back out to the self-antigen in answer to its initial signal. “The inside-out return signal had not yet been reported for this T cell receptor,” Zhu said. Receptor fires signal into cell and interacts with self-antigen too aggressively. Inside cell membrane, signal pulls CD8 closer. Outside cell membrane, CD8 strengthens handshake. When the self-antigen slips a bit, the double-handed grip can coax it back into the receptor, kicking off another signal, restarting the signaling cycle again and again. Many feedback loops increase likelihood of programmed cell death. 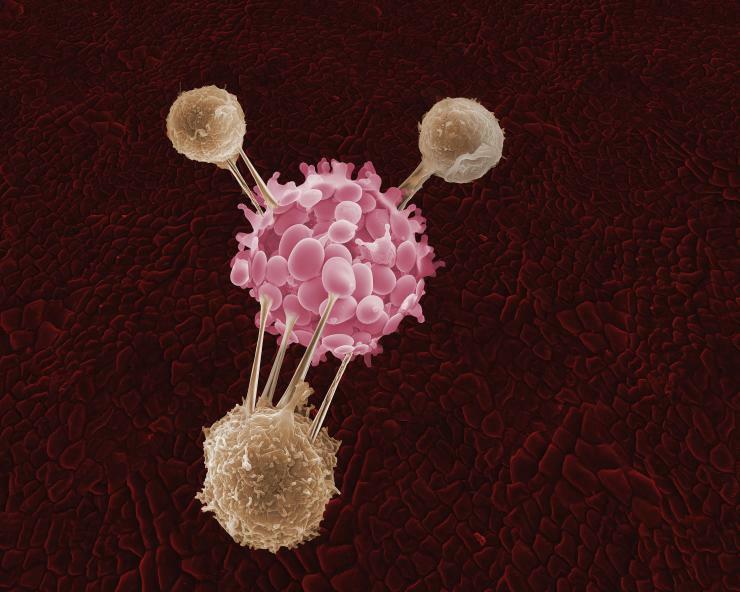 Three T-cells attack a cancer cell in this artist's depiction.